High in the Austrian Alps an ageing entrepreneur Franz (Karl Fischer) is eagerly demonstrating his new chemical to produce artificial snow to potential Russian investor, Chekov (Kari Rakkola), who gets a face full of the luminous chemical and instantly starts spewing green slime. To try and close the deal they take him to the local bar to ply him with alcohol. Meanwhile, a snowboarding team royally balls up a sponsorship deal and end up stranded at the very same bar as Franz which is also having its end of season Après-Ski party. Chekov is pretty much in full zombie mode by now entranced by the music but as soon as it stops he starts getting bitey and soon starts turning the rest of the party. Not only does the chemical turn people, but pretty much anything that comes into contact with it cue some very awesome zombie deer!! The snowboarders, Steve (Laurie Calvert), Branka (Gabriela Marcinkov (Byzantium)) and Josh (Oscar Giese) plus plaited pig-tailed traditionally dressed bar owner Rita (Margarete Tiesel) are trapped and need to escape. On ascertaining that they are dealing with zombies not Rita’s initial thought “It’s the Alco-pops…. They make people crazy” they come to the conclusion that it will require careful planning and skills to get to safety. This Zomedy is filled with blood, guts, hilarious one liners, interesting words (“You scumshits” being one of them), ridiculous happenings and brilliant practical effects. There is no CGI here all the effects are puppetry and good old fashioned prosthetic make up. Director Dominik Hartl is a huge fan of 70’s and 80’s zombie flicks especially Peter Jacksons Braindead and Sam Raimis Evil Dead and AOTLZ really shows this. Ok so this does not particularly bring anything new to the genre there have been a few before it (main examples being the Dead Snow movies and, to an extent, Dance Of The Dead) and it wont be the last but it has it’s own charm and stands amongst these others waving cheerfully and taking the piss out of itself. The acting is great from all especially Rita who uses a variety of weapons from Ski Poles and beer taps to a snow blower to dispose of the undead. 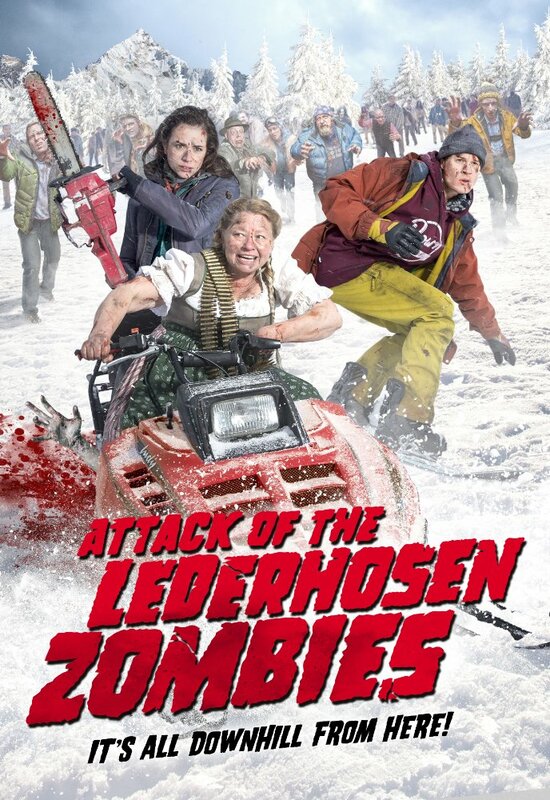 The last third of the film includes an epic and grisly battle mostly featuring snow boards as their main weapons. The soundtrack goes from Pop Punk to Traditional Austrian Folk to 80’s inspired synth! This movie was made for zombie fans by a zombie fan and it really is a lot of fun. From someone that rates Hartls influences amongst her all time favourite movies ever this is a fantastic tribute to them, I totally recommend this for a good laugh.